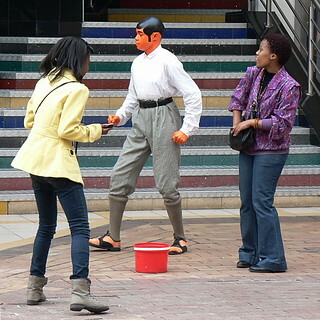 This human statue has long been working Sundays at this spot in The Zone, an upmarket shopping precinct in Rosebank, Johannesburg. Drop money into the red bucket and he dances, much to the delight of children and the young at heart. One thing's for sure - the reactions of the passers by are more entertaining than the busker is. Over the years, his makeup has become better and better. It must be very uncomfortable. But worth while ... the money pours in.